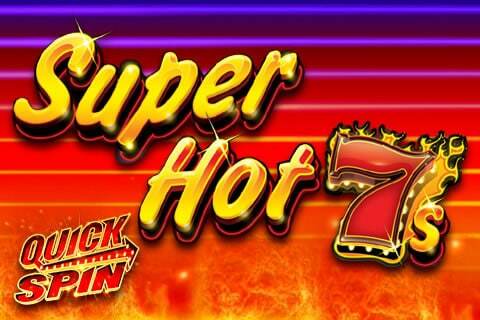 Super Hot 7s Quick Spin is a fruit machine inspired slot from Aussie developer Ainsworth. Played using a 5 reel, 40 payline game engine, it comes with a free spins round and spin the wheel bonus where 4 potential jackpot prizes are up for grabs. Stakes range from between £1 and £10 per spin. Like most slots in the Ainsworth catalogue, the design in Super Hot 7s Quick Spin is very simple. The imagery has the look of a brick and mortar casino slot and truth be told, looks a bit tired. Free Games feature – land the free games scatter on reels 1, 3 and 5 on the same spin and you’ll receive a payout of double your total stake plus 8 free spins. A new paytable is used during these feature and the rewards are all trebled. Land 5 treble 7s and you’ll win 30 times your total stake rather than the 10 on offer in the base game. The wild could deliver payouts of up to 60 times your stake here. Re-triggers are possible too if the scatters fall nicely. Wheel feature – this triggers when you land the wheel bonus symbol on the middle 3 reels on the same spin. Spin the wheel. You’ll win a cash prize or 1 of 4 jackpot prizes depending on where the pointer lands. The Grand Jackpot pays a bumper £10,000. We’ve sometimes been a little unkind towards Ainsworth slots. The design here certainly won’t be winning any awards but the features offer some decent potential. There’s nothing here you won’t have seen in other slots but the 3x multiplier is a welcome addition to the free spins round and the wheel bonus can deliver some big awards. It’s not particularly innovative but if you’re an old school fruity fan, there’s enough on offer in Super Hot 7s Quick Spin to make it worth a look. If you want something with modern features and superb graphics, you cannot go wrong with NetEnt’s Vikings – which also offers payouts of 10,000 times your stake on each free spin.